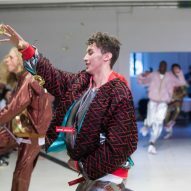 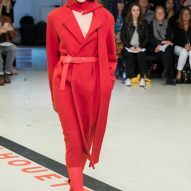 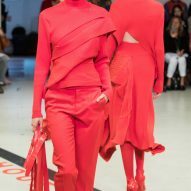 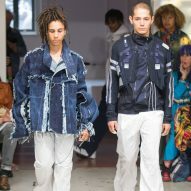 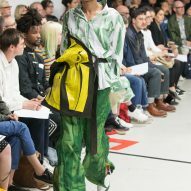 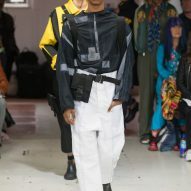 As voters took to the polls last week for the UK's general election, the Royal College of Art's MA fashion students were putting on their end-of-year show at an old studio in east London. 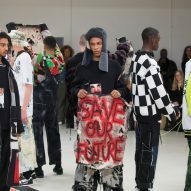 Design reporter Alice Morby picks her highlights from the evening's catwalk show, installations and performance pieces. 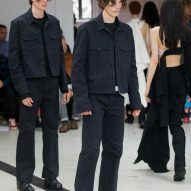 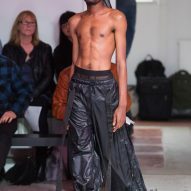 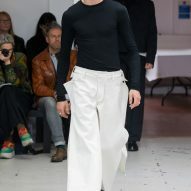 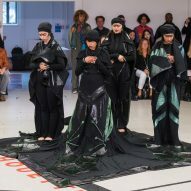 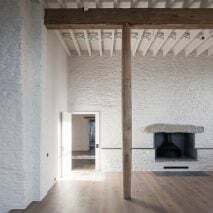 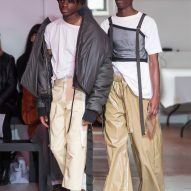 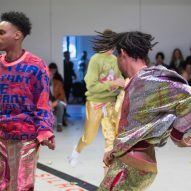 The RCA MA Fashion show took place last week in a space in Shoreditch that was once the studio of Turner Prize-winning artist Rachel Whiteread. 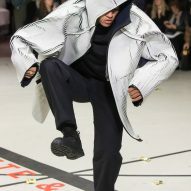 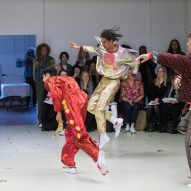 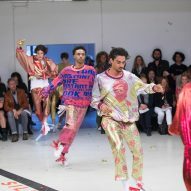 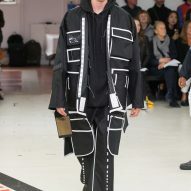 Typical of an RCA presentation, the show's format included a range of performance pieces and installations as well as a more traditional catwalk show. 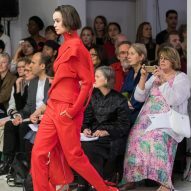 The presentation – held on the same night as the UK's general election – had strong undercurrents of race, class and gender exploration, something course leader Zowie Broach attributed to the current political climate. 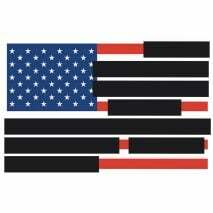 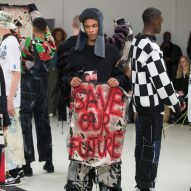 "It is fitting that the show takes place at the very moment when the UK decides on its future government," said Broach. 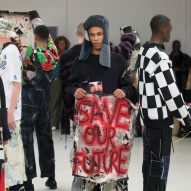 "Since the UK voted to leave the EU last June, students have been asking urgent questions about owning their own culture that haven't been asked for generations." 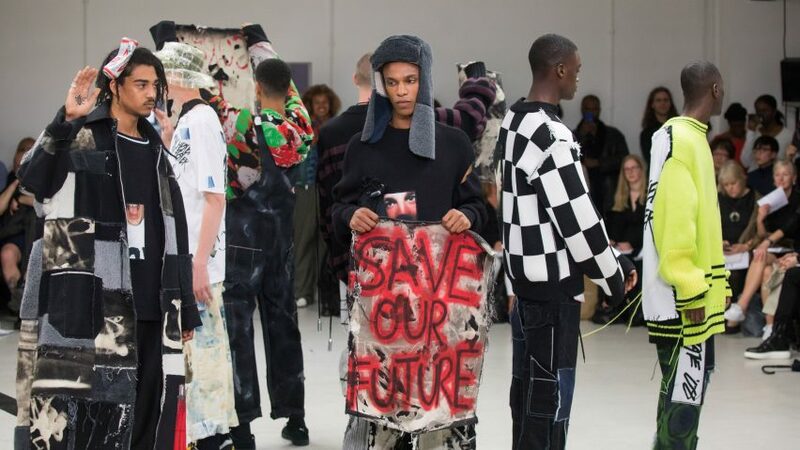 "They have been pushed to ask deeper questions about fashion within the current political climate and its power to effect change in this unsettling landscape." 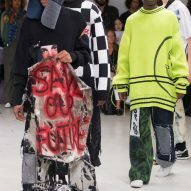 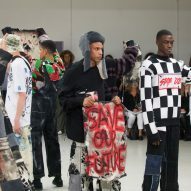 Ellie Rosseau's menswear pieces were influenced by the Manchester club scene, with trippy coloured knits combined with graffiti-style messages. 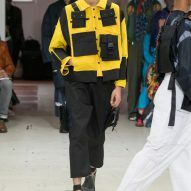 It was probably the most poignant collection of the night, given its connection to Manchester, and Rosseau paid tribute to the recent terrorist attacks with models presenting a bee symbol – an emblem of support widely shared on social media – on their hands. 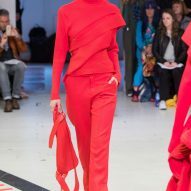 She also pledged her support for Jeremy Corbyn, with a sign saying "Corbyn in Tories out". 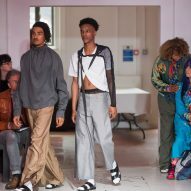 Many members of Charlotte McDonald's family have been in the military, something that has inspired her interest in masculinity and how it is represented. 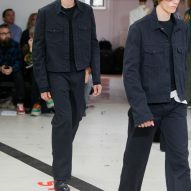 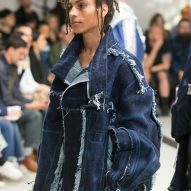 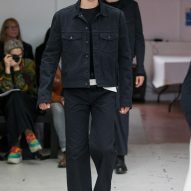 Her uniform-style collection was made using a process called radio frequency welding, which involves using an electromagnetic current to weld the layers of rubber and denim together. 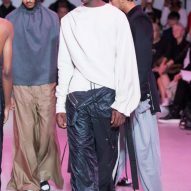 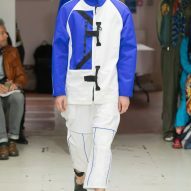 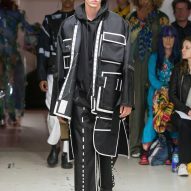 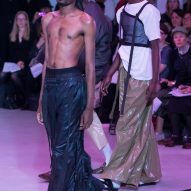 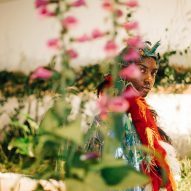 Titled Personal Politics, Bianca Saunders' graduate collection is an extension of her research into defining modern black masculinity. 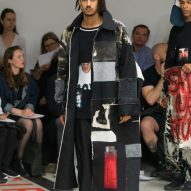 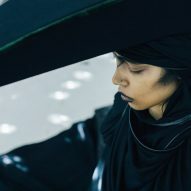 When designing the garments, she used interviews with writer Kareem Reid as a starting point for conversations she then had with fellow students at the RCA about their own identity. 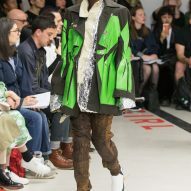 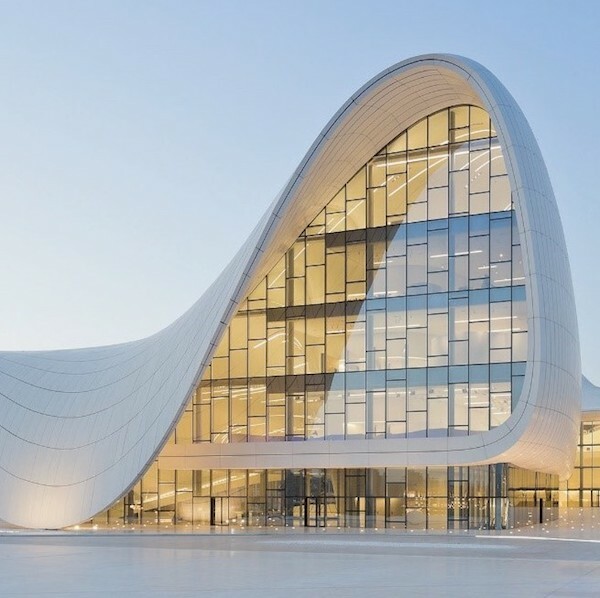 From this, she created clothes that challenged the preconceived ideas they spoke about – resulting in outfits made from contrasting fabrics that had been textured with pleats and draped elements. 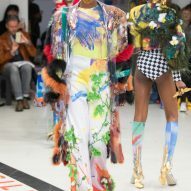 Given her interest in the way the clothing responds to movement, Rhiannon Wakefield created a "kinetic textile" for her garments that showed different textures and flecks of colour as the models moved around the catwalk. 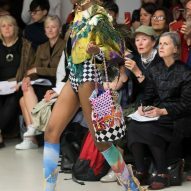 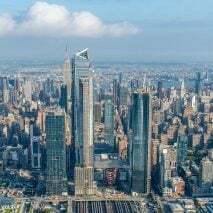 "I believe in the importance of understanding and appreciating the relationship between textile and garment, with the harmony between the two allowing for every piece to be completely unique to its purpose," she said. 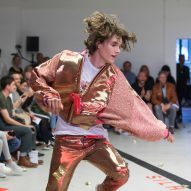 Jennifer Koch's models came bounding down the catwalk in metallic tracksuits while throwing fortune cookies at the audience. 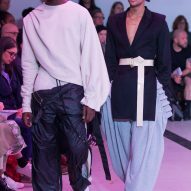 "Im influenced by the awkward moment after a racially insensitive question," she said. 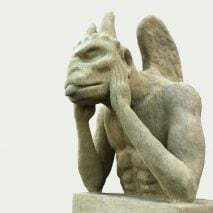 "It's the moment you struggle to tell someone off or laugh it off and crack a joke to show the insensitiveness. 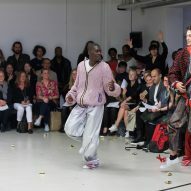 I consider myself a happy person who will always answer with humour." 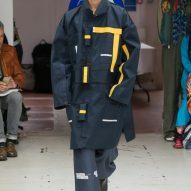 Mathilde Krab Nymann's collection was strikingly understated. 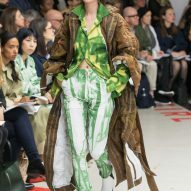 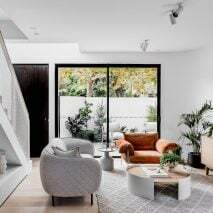 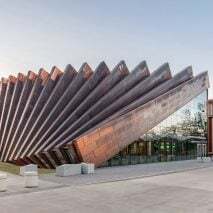 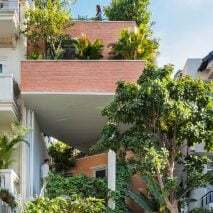 She based the collection on the personal thoughts and reflections she'd had throughout her time on the masters course, particularly thoughts that had made her "reconsider prior assumptions". 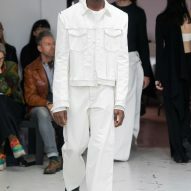 A simple, monochrome palette allowed the garment's construction to become the focus, with seams appearing on the outside of workwear-style jackets and trousers. 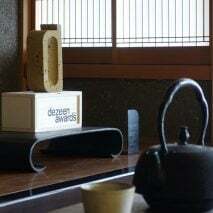 Inspired by monotonous and repetitive trips from studio to home during the course of the masters programme, Seunghee Lim began looking to the way everyday objects themselves can be "objectified". 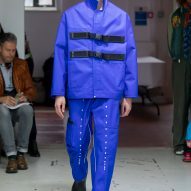 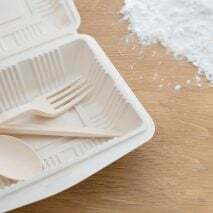 A ready-meal case provided the inspiration for this final collection, specifically its moulded sections and labels. 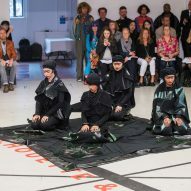 "I wanted to show this as ordinary and reject a concentrated aesthetic of beauty," said Lim. 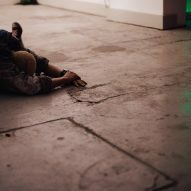 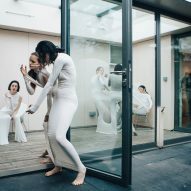 Inspired by smokers outside on the street, Binbin Hu's performance sought to expose the relationships these people develop with the space they have to smoke in. 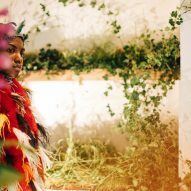 Sitting inside a small courtyard, models were bound to each other in white jersey outfits. 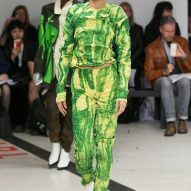 Camilla Damkjaer's womenswear collection featured a bold colour palette of lime greens, yellows and browns. 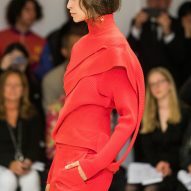 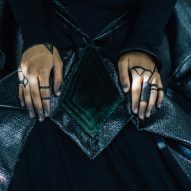 In hopes of "celebrating the human touch", texture became an important part of her designs. 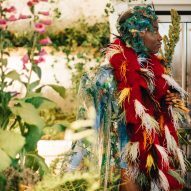 "My work revolves around creating material and techniques that capture the agency of the wearer's body," she said. 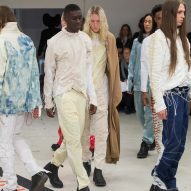 Icelandic Arnar Mar Jonsson looked to his native culture, citing drinking being one of the "main activities" that takes place there. 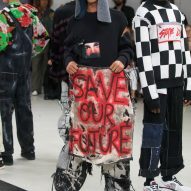 He looked to the way football shirts spark conversations, and how this relates to a form of "neo-tribalism" that means people engage on the basis of common interest. 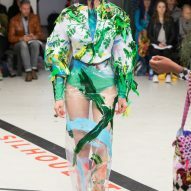 "Informed by being from Iceland where being in nature and drinking culture are the main activities. 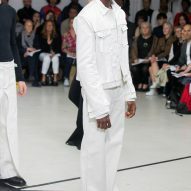 By observing my social environment, through my people, I use that observation to inform my garments," he said. 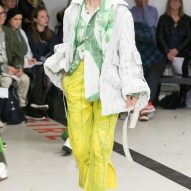 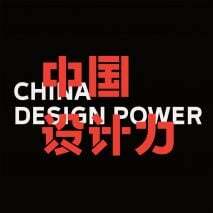 Middlesborough-born Matthew Duffy was another designer who cited football kits as a point of inspiration. 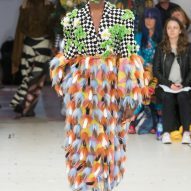 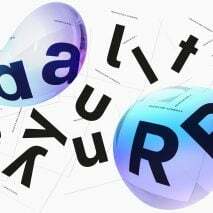 He looked at gender-related performances in his family, his brother being a footballer and his mother being a beauty queen, and created outfits informed by sashes and football knits. 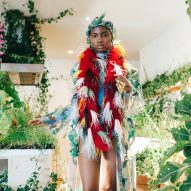 "The football kit and the pageant sash are both images of my family's ability to pass and thrive, " he said. 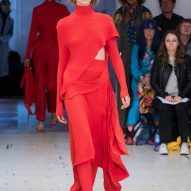 "I used these pieces as the basis of my collection - I recontextualised them into something I understand and take ownership of through drape and knit." 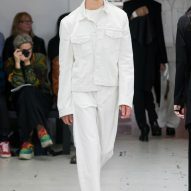 Located on the top floor of the studio space, Dan He's collection was eerily presented on models that looked like mannequins. 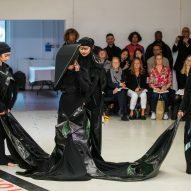 Inspired by technology, engineering and non-fashion-related materials, he created dresses from carbon fibre that covered the models' heads and were illuminated in some sections. 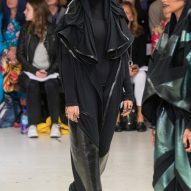 Zahra Hosseini opened the show with her Iran-inspired collection, which aimed to put across a message about the way Islam is misconceived in the western world. 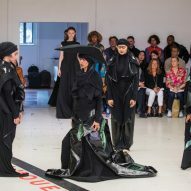 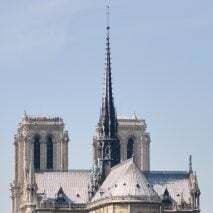 She created a gown that was gradually dismantled and spread across the catwalk by four models, who then knelt onto each section and began to pray. 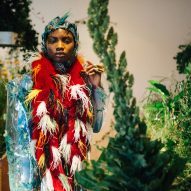 Rosie Danford-Phillips was inspired by "an intense desire to infect sterile white spaces with nature", and sent colourful garments patterned with floral arrangements, trees and butterflies down the catwalk. 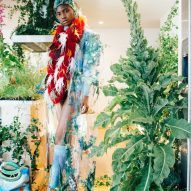 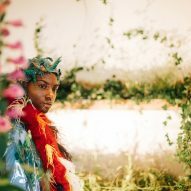 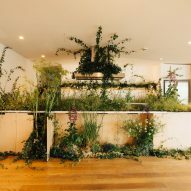 She also had an installation upstairs, in which a model was hidden within an abundance of greenery. 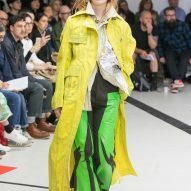 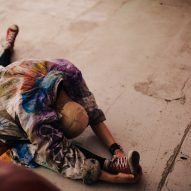 Abbie Stirrup's performance in the basement involved models being doused in neon slime, creating what looked like a skin-tight body suit. 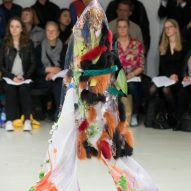 She takes inspiration from her personal life experiences and – obviously – colour.